West Indies batsman Darren Bravo sways away from a bouncer against England in the 2nd Test in Antigua. DARREN BRAVO has often been likened to his idol and Windies legend Brian Lara, but the 30 year old produced an innings more synonymous with Kraigg Brathwaite or Shivnarine Chanderpaul in the 2nd Test match against England at the Sir Vivian Richards Stadium, Antigua. The left-hander occupied the increase for more than six hours to score a half-century that steered West Indies to a healthy first innings lead which proved pivotal in helping West Indies clinch the three-match Test series 2-0. Bravo's 50 off 216 balls was the slowest ever by a West Indian (by time) and the third slowest ever. Nevertheless, former West Indies fast bowler Tony Gray rated Bravo's knock as his best ever. 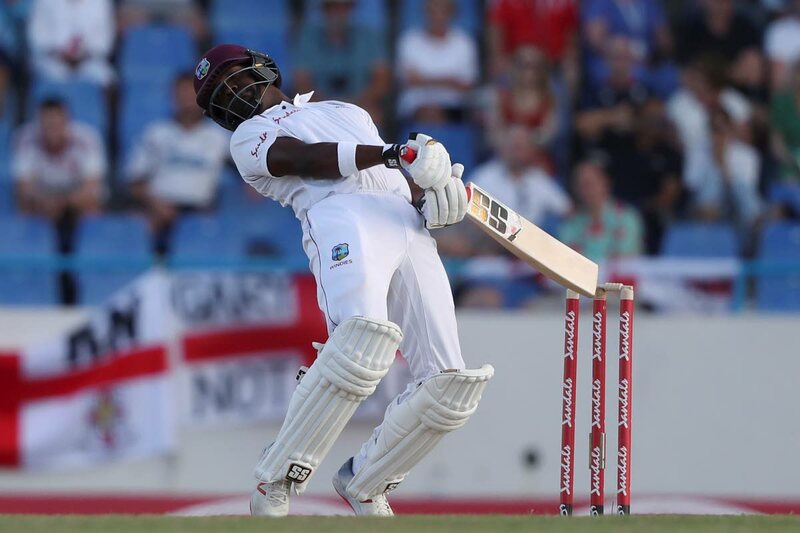 Bravo, who recently returned to the West Indies Test team after last representing the Test team in October 2016, showed tremendous determination to defy the English on a pitch that was not conducive for strokeplay. Bravo's strike rate of 23.15 was below his career strike rate of 45. His score, however, helped the regional team to 306 in the first innings, after dismissing England for a dismal 187 batting first. England struggled again in the second innings only posting 132, giving the Windies the simple task of scoring 14 for victory which the regional team got without losing a wicket. Gray, who played five Tests and 25 One Day Internationals, commended Bravo on his knock. He said, "Bravo's knock was special. It was the slowest knock but it was the most important knock of his career because you have to put a lot of things in context. He did not perform well in the first Test match (dismissed for two and one), coming into rhythm in Test match cricket (would have been challenging) because he just had one first class game before." Bravo had a top score of just 38 in the sole regional four-day match he played this season against Jamaica. Gray says the Windies batting has potential with Bravo showing signs of coming into form. "We have some very good young batsmen now. You have Bravo; you have Shai Hope; you have (Shimron) Hetmyer; you have (Kraigg) Brathwaite, who needs to improve; you have (Jason) Holder, one of the best all rounders in the world right now. You are seeing Bravo's knock solidifying the middle order and, in the context of West Indies cricket, it is great to see him back and not studying the recent past but studying the ball coming at him...and it was a wonderful effort from him. The best knock I have seen him play in the context of everything that has happened recently." Reply to "Gray: Best ever from Darren Bravo"